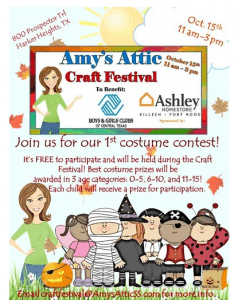 Amy’s Attic Craft Festival for Boys & Girls Clubs of Central Texas is hosting a COSTUME CONTEST on October 15th, 2016! The 2016 Craft Festival is free to attend and the contest participation is free. Prizes will be awarded to the best costume in the following age groups: 0-5, 6-10, and 11-15. Participants are welcome to register any time between 11 am and 2 pm. We can’t wait to see how creative you can be! Questions or interested in becoming a vendor? Email craftfestival@AmysAtticSS.com!